I don't work with shared libraries very often, but I came across a shocking problem in a legacy product. Basically because the application and the shared library both defined the same symbol (i.e. function) and because no effort was made to control what the .so exported, the wrong symbol was used at runtime. This turns out to be consistently reproducible and avoidable by setting up a symbol barrier when creating the shared object file. The tools you need are described on gnu.org. An in depth explanation is available on akkadia.org. See also the Solaris Solution. -o <file>  Specify the name of the output file. -s         Remove all symbol table and relocation information from the executable. -L<dir>    Add to the list of directories to be searched for libraries. processes libraries and object files in the order they are specified. plus any that you specify with -L.
Compile the worker into an object file and wrap it as a static lib. Compile the application into an object file and wrap it as a static lib. Link the static libs into an executable. Note that the linker only looks further down the line when looking for symbols used by but not defined in the current lib. Thus the lowest level libs should go right-most and the left most symbol will be used when conflicts occur. 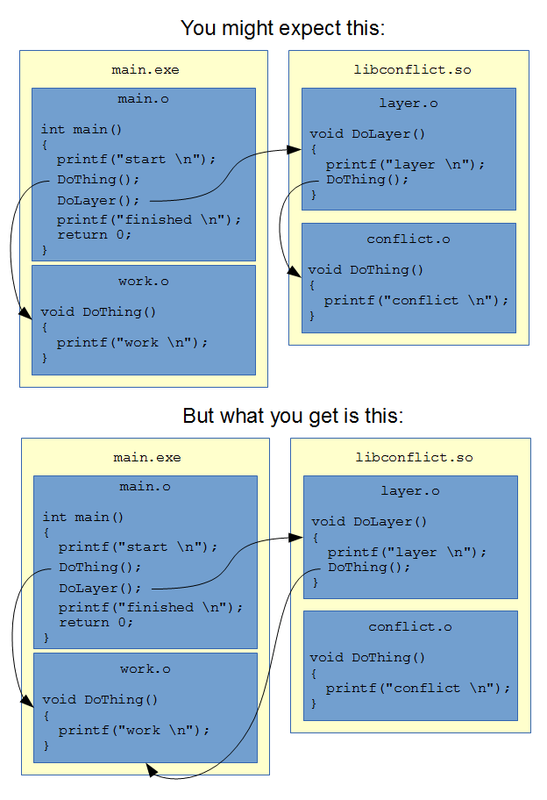 Compile the conflict into an object file and wrap it as a static lib. Link (without warning) with priority given to work. Link (without warning) with priority given to conflict. Instead of a static library, package conflict as a shared library. Now, introduce a new layer to call the conflict within the shared library. And update the application to call they layer instead of calling the conflict directly. Now re-introduce the worker to observe the conflict. Because work.o exists in libmain.a the DoThing() call from main() correctly executes from work.o, but surprisingly the DoThing() call from layer.o also executes from work.o instead of from conflict.o as might have been expected. How might we prevent code within our shared library from calling symbols within our application? Changing the link order reverses the problem. Note the difference between linking with static and shared libraries. Had conflict been a static library then because it didn't come after main in the link line, linking would have failed with "undefined reference to DoLayer()". And as expected, the reverse order for static libraries means the left-most symbol is used by all parties. But this difference presents a solution. If we use the shared library link order that gives preference to symbols from the shared library and we hide those symbols from the application then we get the desired behaviour. -C  Decode (demangle) low-level symbol names into user-level names. only meaningful for shared libraries. -g  Display only external symbols. -a  Display all symbols, even debugger-only symbols. Thus both DoThing() and DoLayer() are exported by our shared library, but we don't want DoThing() exported. Using -fvisibility=hidden during the packaging of the .so has no effect. As far as we can tell the -fvisibility=hidden switch did not effect the produced .o files, but it has changed the resulting .so, specifically it has omitted the DoLayer and DoThing symbols. The result is that our application can't compile because we have excluded all symbols. We must explicitly allow the subset of symbols that we want to export. That's good, but we can do better. Consider the details on gcc.gnu.org and stackoverflow. We might use -s to exclude the debugging symbols, but they already don't appear in our shared library, so it apears to make no difference. Adding the -a switch didn't show any new symbols and compiling with the -s switch doesn't reduce the symbol count. Note that this solution seems to eliminiate the earlier dependency on the link line order. That's all well and good, but it might be a burden to add the __attribute__ decorations to a large ancient codebase that suddenly needs to be used with another codebase but can't due to collisions problems. stackoverflow describes how --version-script can be used instead of the __attribute__ decorations, but it only works in certain scenarios. Compile and link and inspect symbols. That fails if g++ is used instead of gcc. ftp.gnu.org only talks about c. sourceware.org talks about c++ but it's not clear what linker they're using. cygwin.com shows a more complicated syntax. Using * on both sides works, so the issue must be name mangling. You don't have to use ** if you provide the full mangled name. In this way it also works with g++. Returning to the original problem, you can compile without visibility flags and without source code decorations. Then find the mangled symbols. Then produce an export script. Then construct a shared library that exports only the required API. And you don't have to worry about order on the link line. Finally, if your exported symbols are sufficiently unique, instead of looking up the mangled names, you could use double asterix. As described by akkadia.org and discovered during the Solaris Solution, the best practice is to use -fvisibility=hidden during compile from .cxx to .o with __attribute__ ((visibility ("default"))) in the source to indictate just those functions that outsiders will be allowed to call. The problem with that is you might have to update hundreds of source files. If you're lucky and somone already did this for windows __declspec and you're extra luck and they did it wit a macro, then you might get away with a minor tweak like this. Unfortunately it's a bit more complicated on Solaris. Let's start with a simple demo. This demo shows the symbol conflict problem where they layer is implemented as a class. Now lets solve the problem with the -fvisibility=hidden and source __attribute__ method. The above demonstrates that putting the default attribute on a class function implementation solves the symbol conflict. But can we do the same from the header? The above demonstrates that putting the default attribute on a class function declaration also solves the symbol conflict. But can we do the same from the entire class?